Women on the Wave offered up AF3IRM’s vision of this new wave of feminism, influenced by its 25 year history of women’s organizing. The programming demonstrated a range of theory, activism, and resistance. It featured inspiring and hard-hitting panels, speeches, and performances that covered everything from trauma and healing, reproductive justice and the concept of choice, police brutality, misogyny in schools and academics, the lost history of the goddess, to music and art as a form of resistance. The diversity of topics showed the intersectionality of oppressions and the absolute necessity for women to organize in the face of it all. Women on the Wave was unique in that it placed special emphasis on the need for each individual to participate fully and also collectively in the movement for women’s liberation by envisioning and manifesting a new and just world. As part of envisioning a new world, the summit pushed attendees to theory build within group discussions, as they deconstructed points made in the earlier plenaries and brainstormed future action. In addition, participants were asked to join in the fight for women’s liberation by signing on to the five summit affirmations that outlined AF3IRM’s movement forward. The need to take part in the shaping of a new world was made even more striking by an emotional moment of silence during the Five Continents Feminism plenary. Rosca asked all to remember the missing and murdered women throughout the world, from Juarez to Canada’s indigenous women and Guatemala to here in the United States, and to remember that they and this ongoing war against women are the reason participants have gathered together. With gender-based violence and harassment an every day occurrence on almost every continent, the push for new, more comprehensive waves of feminism cannot be denied. In the days surrounding the summit, the media provided several reminders of the harsh realities that women face – with the murder shooting of Detroit’ s Mary “Unique” Spears and the slashing of a woman’s throat in Jamaica, Queens after both refused unwanted advances, with the killing of trans-woman Jennifer Laude in the Philippines by a US Marine, and with the forced cancellation of a talk by feminist game critic Anita Sarkeesian after receiving death threats. It is obvious that women, especially women of color, are not safe and continually face the threat of violence. For the women of AF3IRM, their reaction to this is clear – that without consistent organizing and activism, without women taking their place at the forefront of the struggle, and without women creating the world they envision where women can not just survive, but thrive, this world will only continue these politics of subordination, oppression, and femicide. “This is the kind of moment when everything makes sense,” said French-Chilean emcee Ana Tijoux as she spoke to attendees after her talk and performance. Indeed, the summit for some was the first time they were able to see themselves as active participants in this revolution. For once, they were able to break free of spaces dominated by men and were finally able to place their experiences and their voices as women in the center of the discussion. Women on the Wave helped others feel re-energized and hopeful for a better future. For many, the summit exposed them to new ideas and sparked a fire within them to take their feminist practice into their everyday lives and actions. The multiplicity of ethnicities and backgrounds, the emphasis on the woman-identified and the combination of theoretical and practical discourse from those whose activism both mirrored and yet were distinct from one another — all these created a multi-layered paradigm for AF3IRM members and supporters. As a first step toward a comprehensive ideology that would push the tsunami of women’s activism in the coming years, the Conference was both a summing up of AF3IRM’s four years of operation as a transnational feminist organization and a harbinger of the directions it will take. The summit was a signal and a battle cry that women are no longer content to have their liberation defined by elements outside of their collective existence and activity. The cudgel is in their hands — to build a world view and activism that unapologetically give due importance to the world of women. In a history replete with failed visions of the future, there is no other choice. 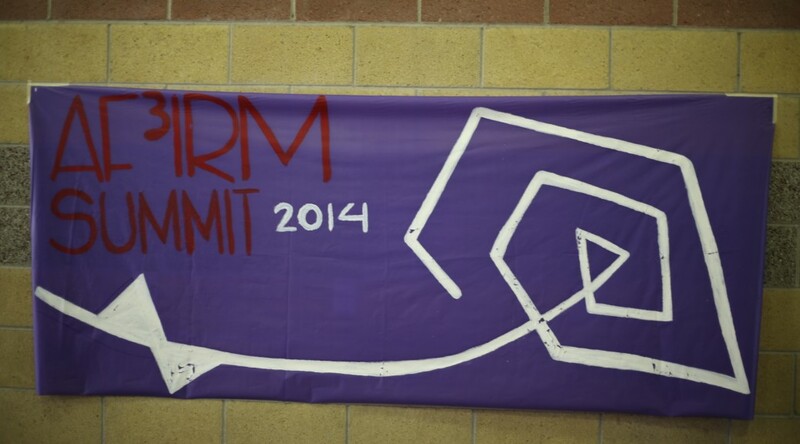 View the Summit Affirmations here. Thank you for joining us at the AF3IRM National Summit!